This is the day the Lord has made; let me be glad and rejoice in it. I am the child of the living God, and therefore I can rejoice throughout the difficulties of this life. For although I now see the glory to come only dimly, as in a mirror, this day is precious. Let me live this day as the gift it is, for God has truly blessed me to live it. And if I may suffer, I will carry with me the certainty that one day I will see God face to face, a day when all things will become clear and my pain will be made whole through the grace of Christ, my God. Blessed be you, oh Lord my God, and blessed be the day you have given me. Then Isaac said to Jacob, "Please come near, that I may feel you, my son, to know whether you are really my son Esau or not." So Jacob went near to Isaac his father, who felt him and said, "The voice is Jacob's voice, but the hands are the hands of Esau." And he did not recognize him, because his hands were hairy like his brother Esau's hands. So he blessed him. He said, "Are you really my son Esau?" He answered, "I am." Then he said, "Bring it near to me, that I may eat of my son's game and bless you." So he brought it near to him, and he ate; and he brought him wine, and he drank. and blessed be everyone who blesses you!" As we expected, Rebekah's plan is a success. 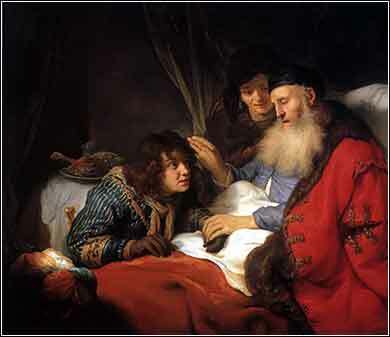 Isaac, who is blind, is fooled into thinking that Jacob is his older brother, Esau, and gives Jacob his blessing. To understand the significance of this, remember how long ago this occurred. It is a day and time when writing hardly existed in its most primitive form and there were practically no courts. The giving of a blessing was as significant as taking a wedding vow. And it was, as we will see, irrevocable. The blessing itself is preserved for us to read, and its content gives us an idea of its significance. No doubt it was something that was learned, rather than something Isaac made up off the top of his head. It is a ritual, in which Isaac first kisses his son and then smells his clothing. He recites that he has smelled his son, and then gives what we would consider a blessing: He prays, in effect, that Jacob will have rain and crops. But then, when he says "Let peoples serve you" he indicates that the boy is to have general leadership, and when he says "Be lord over your brothers," it is not a wish, but a command, like a king putting a sword on a knight's shoulder. Jacob has been declared the head of Isaac's family. Finally, Isaac curses anyone who might curse Jacob and blesses anyone who might bless him. This is the authority that Isaac himself took from Abraham; Jacob is to be the rightful head of the family, and those who do not acknowledge him will be outcast. Blessing of Jacob by Govert Flinck, c. 1638. This handsome painting of Isaac blessing Jacob by Flemish master Flinck has Jacob dressed like a contemporary cavalier. His face looks European, although Isaac has more Semitic features.